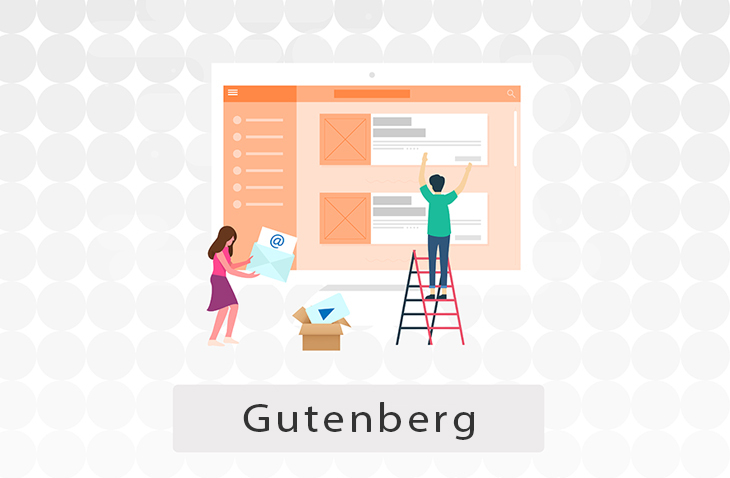 If you are familiar with WordPress and WordPress themes and keep yourself up to date on what is going on then you may already be familiar with Gutenberg. For those of you that don’t know what it is, or don not know much about it, Gutenberg is a relatively new way to edit content in WordPress. It is replacing the old TINYMCE post content editor and as of right now it is only available as a plugin to ad on to your theme. As is always usually the case with newer technology, sometimes it does not always work with older things. 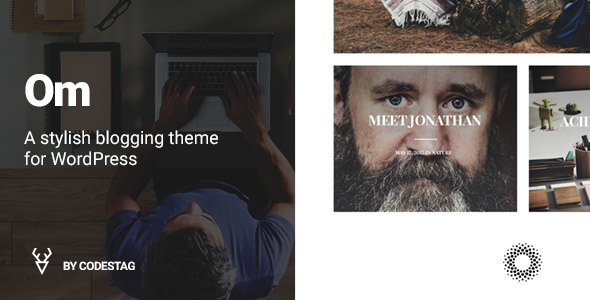 Therefore if you want to use Gutenberg you must first make sure that your theme will be able to support it so you can use it. The Gutenberg will be just as easy to use as some of the other visual content editor that WordPress has so you do not have to worry about it being difficult to use if you are not very tech savvy. But how can you know which themes can use Gutenberg? That is why we put together this list of Gutenberg optimized WordPress themes. If you have been using WordPress for a while then you probably know of the Visual Composer or Siteorigin or other page builders. And I know change can sometimes be scary but the Gutenberg plugin will allow you to customize your site just the way you want, like other page builders would. 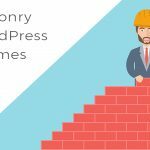 So we have brought you the top 25 Gutenberg optimized WordPress themes so you do not have to go through the hassle of finding out which ones will work with the plugin. 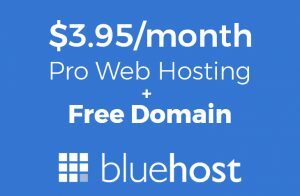 So let’s check them out back to back to see which one will provide you with the tools that you need to build your own one of a kind website. 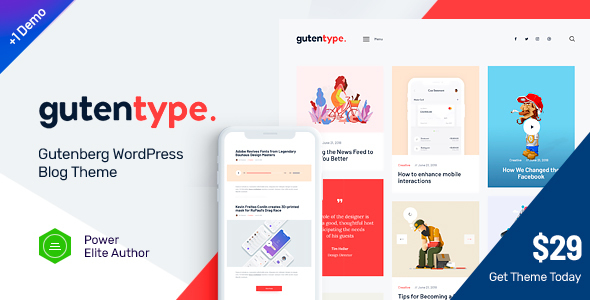 And we start off our Gutenberg optimized WordPress themes with a theme that has a very fitting name, Gutentype. This WordPress theme is a modern looking theme geared towards being used to create personal blogging websites. It is based on the Gutenberg page builder which will provide you with the tools you need to make your own one of a kind site with minimal headache. It comes with many useful plugins such as: MailChimp for WP, an Instagram feed, WooCommerce and Contact Form 7. The Gutentype theme has a fully responsive design so your site will always look great on any device or any screen size. Your website will also work on several different web browsers with this theme, like: Chrome, Firefox, Safari, etc. It can also work with the ThemeRex addons plugin as well. The Mae WordPress theme is an “event, meetup, and conference management template” that is built on top of the simple and convenient blogging layout. It is speed optimized so you site will have fast loading times, which will make your users happy. There is MailChimp integration which is helpful for you to stay in touch through email with the subscribers of your site. 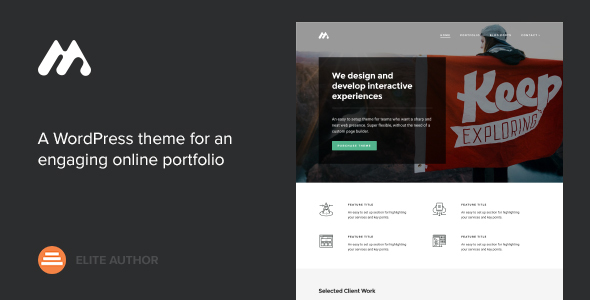 The Mae theme has a fully responsive design so no matter what kind of device your user is using to access your site, your content will always look great. It is a search engine optimized them as well so your site will show up higher in relevant online search results, which can help lead more people to your site. 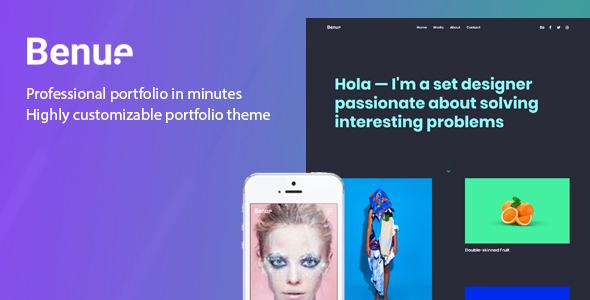 Benue is a portfolio WordPress theme that can be used by: freelancers, creatives, architects, agencies, photographers, video makers, or anyone who is looking to create their own portfolio website. It has a responsive layout so whether your site is being viewed on a large desktop screen or a small mobile one, it will always look great. This theme is retina ready as well so even your images will show up in high quality. Benue can work with the WPML plugin as well which you can then use to translate your website into almost any language you can think of. It has a custom page builder plugin to help make the process of building a site on your own a little bit easier. The Benue theme can work with the Contact Form 7 plugin as well so you will have a way of staying connected with your site’s subscribers. Next up we have the Ink theme which is another blogging theme on our list. It has a minimalist design so your content will be displayed very clearly and easily readable. It has the WordPress live customizer as well which will allow you to see the changes you make to your site in real time without first needing to save. 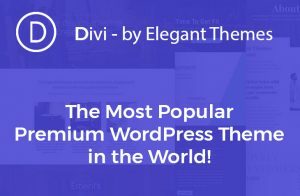 This theme can also work with the Restrict Content Pro plugin so your blog can be turned into a premium content website that will allow your users to become members so they can access restricted content. It has a responsive design so your site will look great on any device no matter how big or small. There is also full localization support with .po/.mo files included with this theme. And we have come to number five of our Gutenberg optimized WordPress themes. The Princess theme is WPML plugin, translation, and RTL (right to left language) ready so you will be able to translate your site into basically any language. By doing this you can widen your user audience and have more views on your site. It is WooCommerce plugin ready as well so you can have an online retail section on your website. 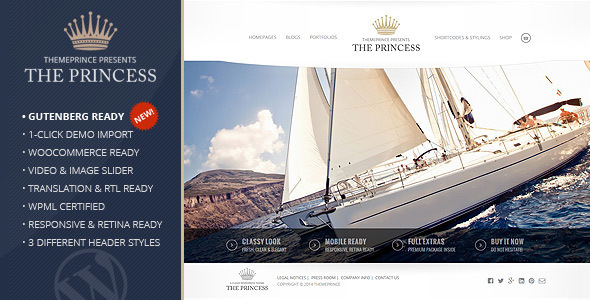 The Princes theme is responsive and retina ready as well so all of your site’s content, even the images, will look great on any device and screen size. This theme has an Unbranded page builder to help you build, customize and design your website exactly the way you want. The Aardvark theme is kind of interesting because it is a little different than our other themes so far. 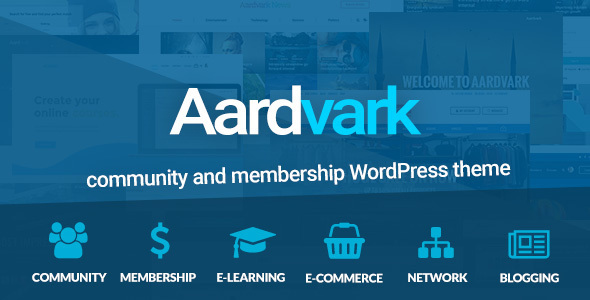 This is a community and membership WordPress theme that was created by “an elite author specializing in BuddyPress“. 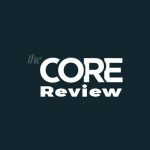 This theme can be used by anyone, especially those that are interested in: building a community, paid membership site, provide online courses, build an online store, General blog store, or run a news site. It comes with Sensei e-learning plugin so you can create courses, lessons and quizzes. This theme uses the WP Bakery page builder plugin to help you with the entire process of building and customizing your dream site. It can work with WooCommerce as well so you can also include an online shopping aspect of your website. You can also use bbPress to add a forum on your website. This next theme, as you can maybe tell from its name, is a theme focused on aerial photography and video. It is a fully responsive them so your site will always be able to format to fit on any size screen and it can be used by businesses or for private use. 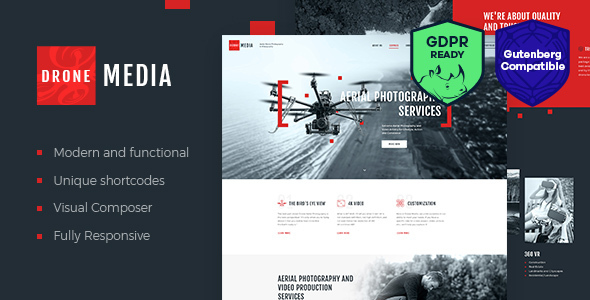 The Drone Media them uses the Visual Composer page builder and its handy dandy drag and drop feature to make building your site super simple. All you will have to do is move your items around the page and place theme wherever you want them to go. It is search engine optimized as well so your site will rank higher in relevant online search results. There is multi language support so if you should need or want to translate your site you will have the ability to do so. There is also support for several plugins such as: Revolution slider, Booked appointments, Essential grid, Contact Form 7 and MailChimp. The Shopkeeper theme, as you can probably tell by from its name, is a WordPress theme geared towards people who are interested in creating their own online shop. 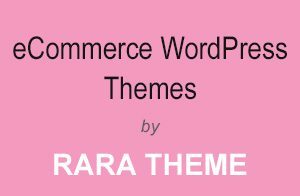 Because it was made for eCommerce creating, this theme is a premium WooCommerce theme. It is currently in its second version and is better than ever so let’s see what it now has to offer. 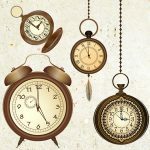 There are 4 new layouts for the product pages, there are product image galleries with Zooming and Lightbox, there is YouTube video support in product galleries, and 3 modern blog layouts. The Shopkeeper theme also has drag and drop for you to build, customize, and manage your website. 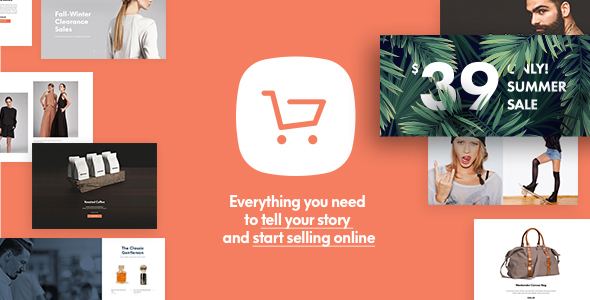 There is another cool feature that comes with this theme and that is the WooCommerce catalog mode which will allow you to turn your selling mode on and off if you are not ready to start selling your products yet. Next up we have a cryptocurreny theme, Lymcoin, so if you are into bitcoin and other forms of cryptocurrency and things relating to it, this may be a good theme option for you. 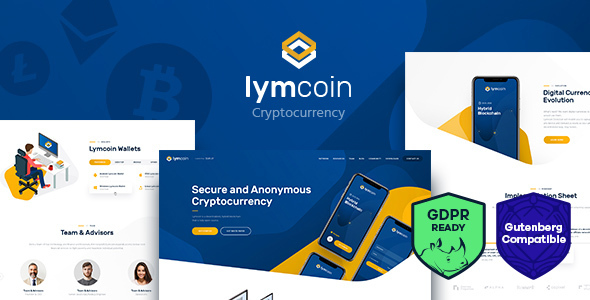 The Lymcoin theme is multipurpose and is perfect for a cryptocurreny blog or cryptocurrency accessories shop or blockchain specialist or any other type of website you can think of having for this industry. 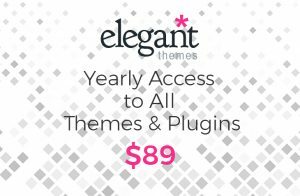 This theme can also work with many different plugins such as: MailChimp, Contact Form 7, Revolution slider, Booked appointments, and Essential grid. Lymcoin comes with the WP Bakery page builder, formerly known as Visual Composer, so creating and maintaining your website should be simple. 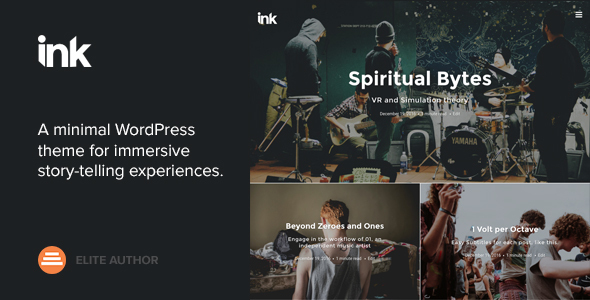 And we have reached the tenth of our Gutenberg optimized WordPress themes with Lamark. 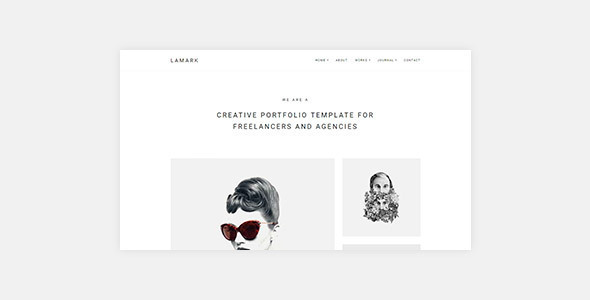 Lamark is a minimalist portfolio theme that is a great choice for designers, freelancers, small agencies or anybody who just wants to show their best work. It comes with the Elementor page builder, which also has a drag and drop tool, to help you easily customize and build your site to meet your exact specifications. It is responsive and retina ready as well so all of your site’s content will look just as good on every device. The Lamark theme’s design is search engine optimized so your site will be ranked higher in relevant online search results. This is good because it will make your site more noticeable and increase your traffic. It can work with Contact Form 7 as well so you will have away of staying connected with your site’s subscribers. 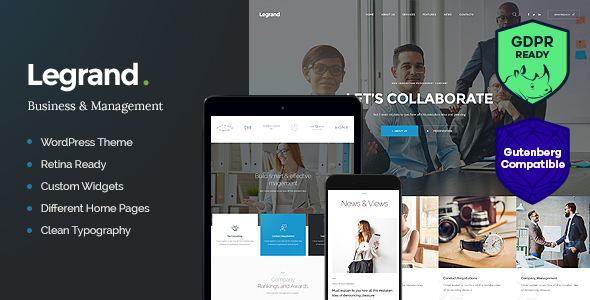 The LeGrand theme is a multi purpose business theme that can be used for a variety of different kind of businesses, including: a law firm, creative agency, tax consulting, freelance, marketing agency or even a startup. The LeGrand theme has the WP Bakery page builder plugin for you to use to customize your site down to the last detail. It can also work several other plugins such as: SiteOrigin page builder, Essential grid, Smart slider 3 and more. A nice perk with the LeGrand WordPress theme is that it comes customized with the help of the ThemeRex addons plugin. 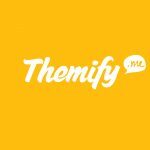 This is great because the ThemeRex plugin will help you do various things like: manage your social media profiles, API keys, and modify post types. There is also mobile device optimization so your site will still look great even on teeny tiny mobile screens. If you are looking to build a BuddyPress powered Community/Social Network WordPress site then look no further than the Kleo Theme. 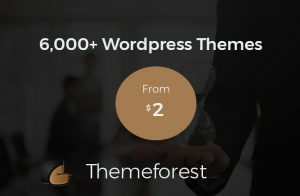 This is the number one selling BuddyPress theme of 2018 on Themeforest. 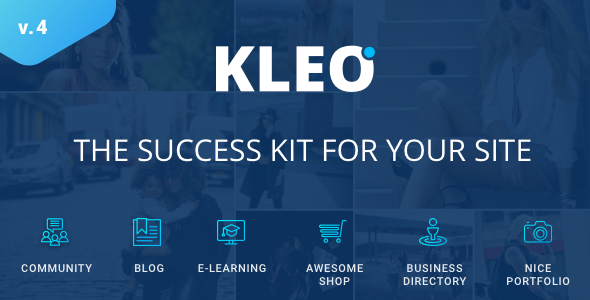 With the Kleo theme you will be able to do things such as: create a professional blog, build a portfolio, business directory or an eCommerce store. This theme has a responsive design so your site will be able to format to fit any size screen no matter how big or small. There is a Live WP Customizer as well which will help you to easily edit and adjust your site and see the results in real time. It also has the Visual Composer page builder plugin with its front end drag and drop feature to make the process of building your site from scratch super easy. 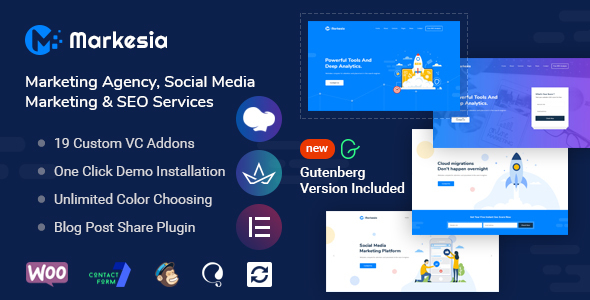 The Markesia theme is a digital marketing agency WordPress theme that can be used for a variety of sites such as: seo services, marketing business agency, consultancy services, or similar sites like social media marketing. This theme comes with four different page builders to give you the ultimate site customizing ability: WP Bakery, Elementor, King Composer and the WordPress Gutenberg. There is also the Contact form 7 plugin with Markesia and Mailchimp integration so you will have a way to keep in touch with the subscribers of your site. It can also work with WooCommerce should you want or need to also have a retail shopping section on your site. This theme’s design is also responsive as well as retina ready. 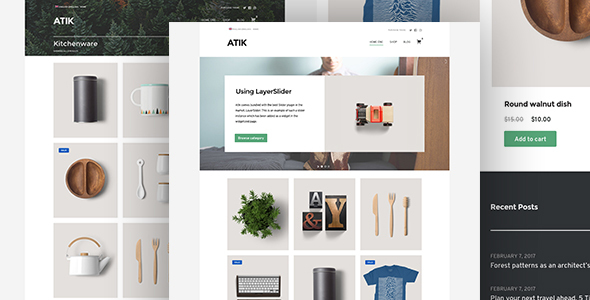 The Atik theme is an WooCommerce theme so if you are looking to start your own online shop look no further. It is completely resposnive from header to footer so no matter what kind of device your user is using to access your site or ow big or small the screen is, your site and all of its content will always look great. This theme has a widgetized approach to content building which means you will be able to create a widgetized page and set up custom layouts that will combine any of the 6 content widgets of this theme. There is an intuitive drag and drop UX with the Atik theme so you should have no trouble create your site’s pages, even if you are a little tech challenged. 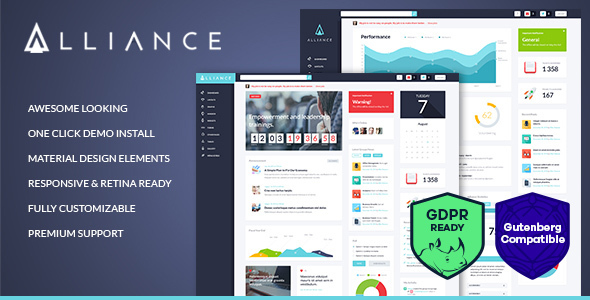 Number fifteen of our Gutenberg optimized WordPress themes is the Alliance WordPress theme, which is a modern looking intranet and extranet theme. This theme’s purpose is to “improve communication inside your company”. Its design is fully responsive and retina ready so all of your site’s content, as well as images, will look great on all types of devices and various screen sizes. It also comes with some great features that can make your site awesome, like run internal polls or run online courses. 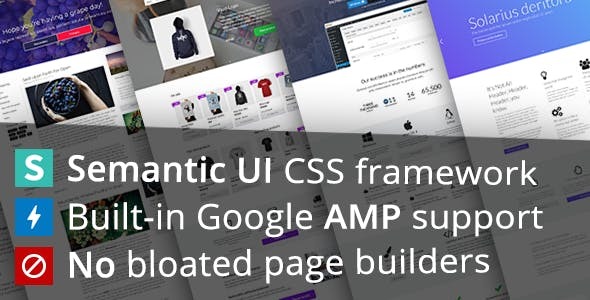 The Alliance theme also has the Visual Composer plugin and the Essential Grid plugin integrated to make the creation of your site incredibly easy. This theme also has BuddyPress to create a corporate community on your site. The Chap theme is an AMP ready WordPress theme that is a great choice for a variety of different kinds of sites such as: blogs, landing pages, businesses, online shops and portfolios. A cool feature of the Chap theme is that it has accelerated mobile pages for nearly instant page loading on mobile devices. This theme works with the WooCommerce plugin so you will have the support to also have an eCommerce on your website as well if you want. There is also support for the Polylang and WPML plugins and RTL support so if you need or want to translate your site you can also do that. This theme has a semantic UI component editor to help you customize your site. Om is a professional WordPress photography blogging site. The Om theme can work with tons of useful plugins to help you give your site more features and tools, such as: Jetpack, Contact form 7, Gravity forms, Stagtools, Stag custom sidebars, and the WPML plugin. This theme is optimized for retina and it has a responsive design so everything on your website will look great on all different kinds of devices. There is full localization support with .po and .mo files so you will have some help if you want to translate your site into another language. This theme can also have a one page design if you would like to do that instead of a multi page site. 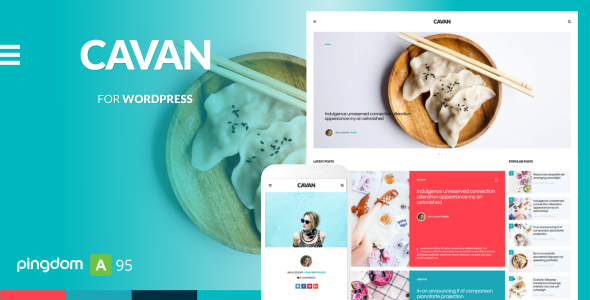 We move on to the Cavan theme of our Gutenberg optimized WordPress themes list. 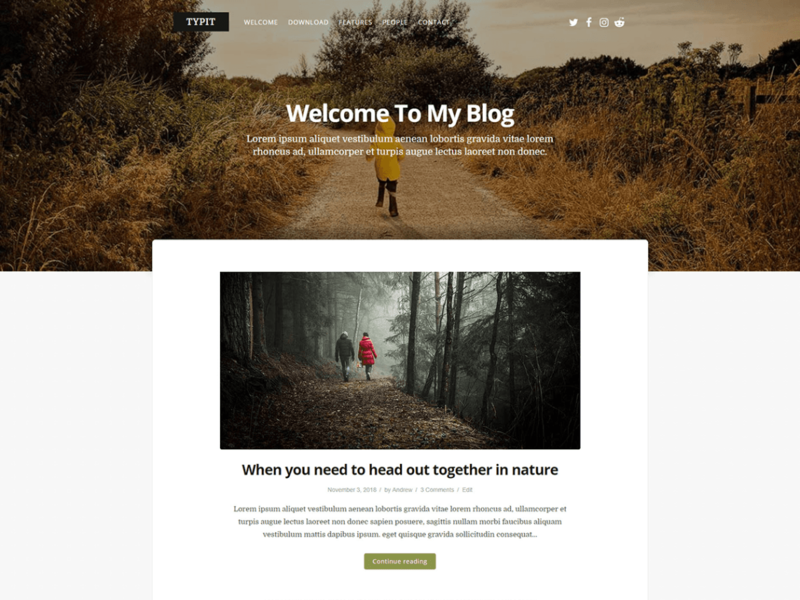 This is another WordPress blog theme that has a multipurpose design so it is great fro any kind of blog you want, food, lifestyle, fitness, you name it this theme can do it. It has the WordPress customizer that comes with loads of settings so you will have a lot of control when customizing your site to your liking. It is retina ready and fully responsive so your site will look great from large desktop screens to small mobile ones. there is also support for the: MailChimp, WP Instagram, and Contact form 7 plugins. Cavan is translation ready as well so you can translate your site if you want. This can be a benefit because translating your site can bring in more users. The Meth theme is a minimal portfolio WordPress theme. you can use it to create either a one page portfolio site or a multi page site. It has an intuitive drag and drop UX to make designing and customizing your site to your exact specifications much easier than you might think. The Meth theme has a responsive design from header to footer s your site will have no problem formatting to any size screen. There is full localization support as well and Meth can work with the WPML plugin so your translation needs should be able to be taken care of should you ever need or want to translate your portfolio site. Number twenty of our Gutenberg optimized WordPress themes list is the Hoverex theme. 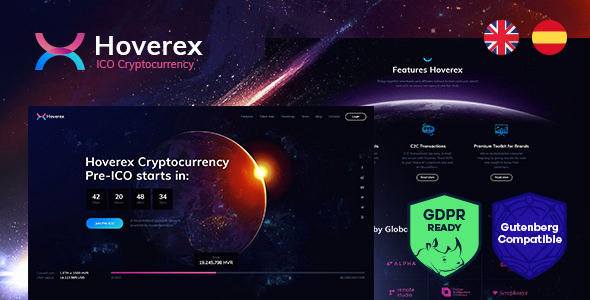 This is a modern cryptocurrency and ico theme, therefore this is a great theme choice for sites like a cryptocurrency site or a financial blog. It can be used to create a website by a crypto company or a ICO agency. 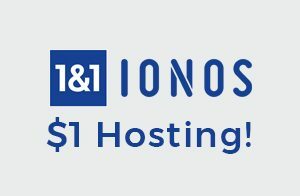 You can use it to promote your crypto corporate firm or sell your coin or accept donations etc. It has several cyrpto specific plugins in addition to the WP Bakery page builder plugin for super easy breezy website customization. There is mobile device optimization so your site will look especially amazing on mobile phones in addition to larger devices. There is also support for several other plugins such as: TRX addons, Essential grid, and Slider revolution. Next up we have the Jacqueline theme. This theme is a health and beauty theme that is a great option to use for spas, salons, masseuses, and wellness centers who are interested in making a website for their business. With Jacqueline you will get full WooCommerce support so you will have full capability of creating your own eCommerce. This theme, just like most of our others, can work with WP Bakery so it will be very simple to design and build your website. 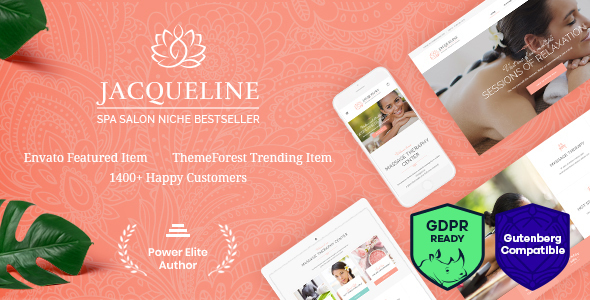 The Jacqueline theme is also search engine optimized which means that your site will show up high in the rankings of online search results which will help bring in more traffic to your site. It is also translation ready so your content can be translated into other languages and widen your audience. 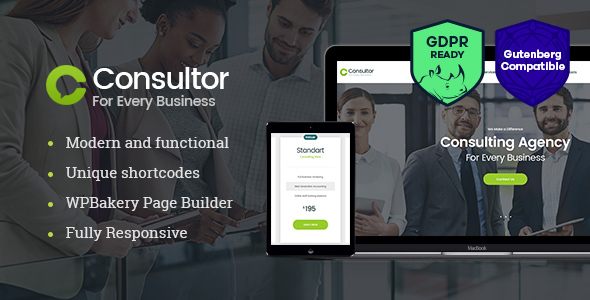 The Consultor theme is a business consulting WordPress theme. 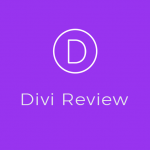 It was designed to be used to create site for things like: investment advising, tax assistance to corporations and individuals, as well as firms and agencies that offer business consulting services. This theme also has the Visual Composer and its drag and drop functionality which means that making your site to meet your exact needs should be easy. All you will have to do is literally move your items around the pages of your site and drop them wherever you want them to go. 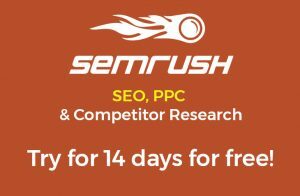 Consultor is search engine optimized and there is support for Contact Form 7, so if you want to use that plugin you will have a way of staying connected with your site’s subscribers. Its design is also fully responsive and has cross browser compatibility. Next up we have the Hope theme, which is a charity non profit theme. It can be used for a few different kinds of sites such as: NGO agency, crowd funding, child care, charity, fundraising, etc. 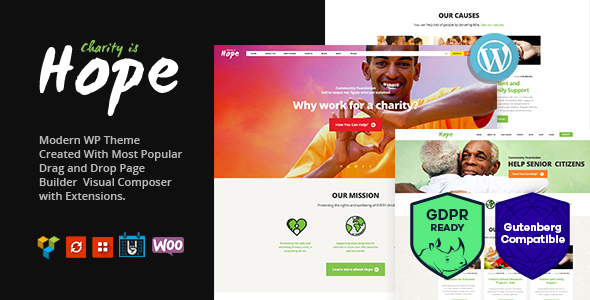 This theme has a cool feature and that is that it comes with the Give plugin which will help your fundraising campaigns, donating, foundations, or charitable trusts. It uses the WP Bakery page builder plugin to allow you to customize your site to your heart’s content without needing to have any coding knowledge. The Hope theme can also work with several plugins including: Essential grid, events calendar, revolution slider and WooCommerce. It is search engine optimized as well so your site will show up higher in relevant online search results. It is also fully responsive and retina ready. 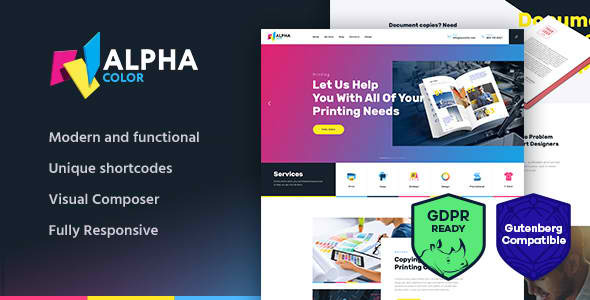 The AlphaColor theme is an interesting theme, it is a type design and printing services that can be used by printing business organizations, corporate copy services company, type design companies, typographies agency, graphic design studio and other similar items. It can work with the WooCommerce plugin so you will have the ability to create an online shopping section of your site if you should want or need it. The AlphaColor theme also has the WP Bakery page builder with it so you can easily customize every aspect of your site. There is mobile device optimization as well so your site will look great even on those small devices. And last on our list of Gutenberg optimized WordPress themes is the Typit theme. 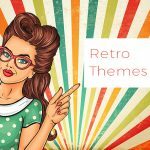 This is a special theme because it is the first and only free theme on our list. This theme was created for bloggers that want a website with a lot of customization options. A really great feature of Typit is that the top header area has so many different variations you can make your blog look completely different. It is a translation ready theme as well so you will have the ability to translate your site into almost any language that you want which can also help lead to a wider audience and therefore more site views and users. You can also do more things like add a page excerpt to your headers or add a title and intro to your blog. So now you know a little more about Gutenberg and that it will become increasingly more popular on WordPress. If you do not already have a theme yet, we highly recommend choosing one of the Gutenberg optimized WordPress themes available so that when Gutenberg is everywhere, your site will be ready.